How my grandparents (and parents, great-grandparents, aunts, uncles, brother, in-laws, etc.) have influenced my life. 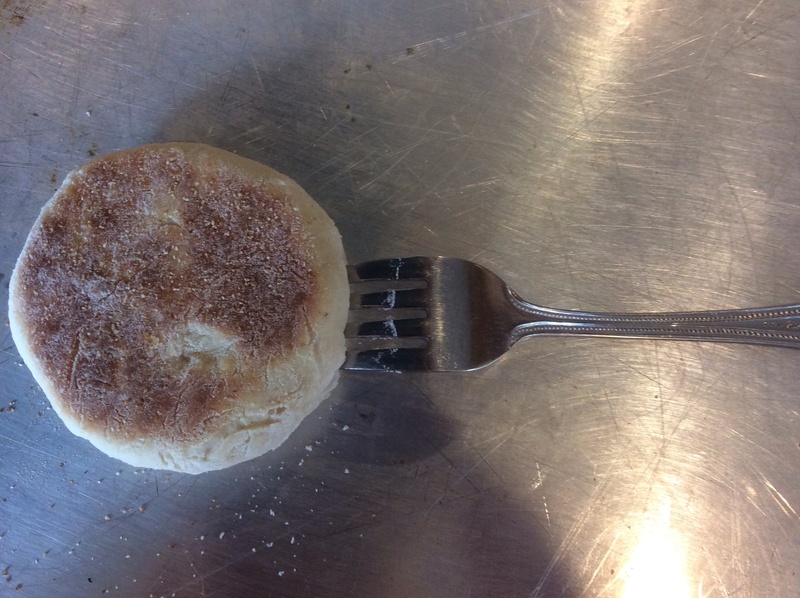 I remember my grandmother, Mommom, making these English muffins once or twice when I was a girl. At the time, I was so impressed that she could make something that we normally bought from the grocery store for breakfast – and hers tasted so much better! They were a treat, and I remember her telling me they were not difficult to make. 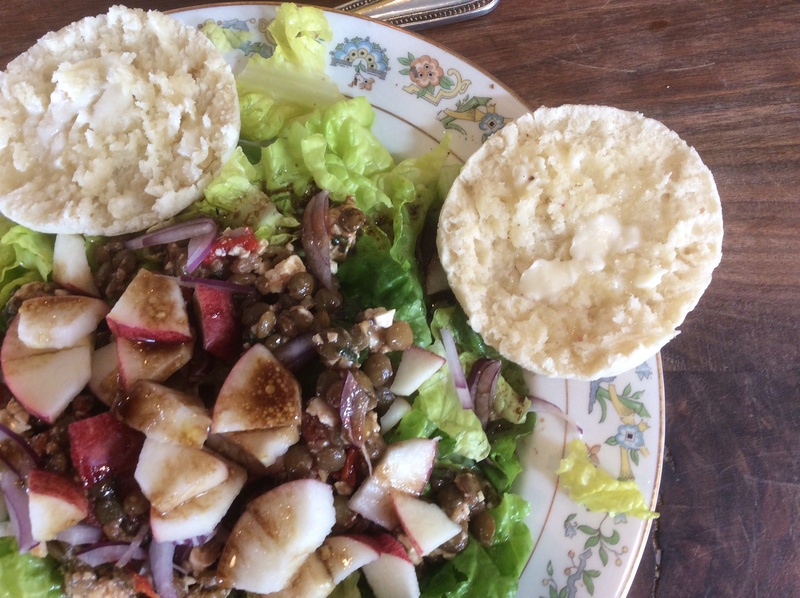 As an adult, I’ve made these English muffins a few times, and they really are pretty easy. You just need a little bit of time, but not even that much! These little breads are tasty and tender. They are really good fresh, but store pretty well for a few days (and serve up well toasted). Officially, these are not baked in an oven, but on the stove top — so I am still with my theme! Here’s the recipe with my notes below. If dry yeast is used, dissolve in water according to directions on pkg – and subtract water used from water in recipe. Combine scaled milk, shortening, sugar and salt. Cool to lukewarm by adding ½ c. water. 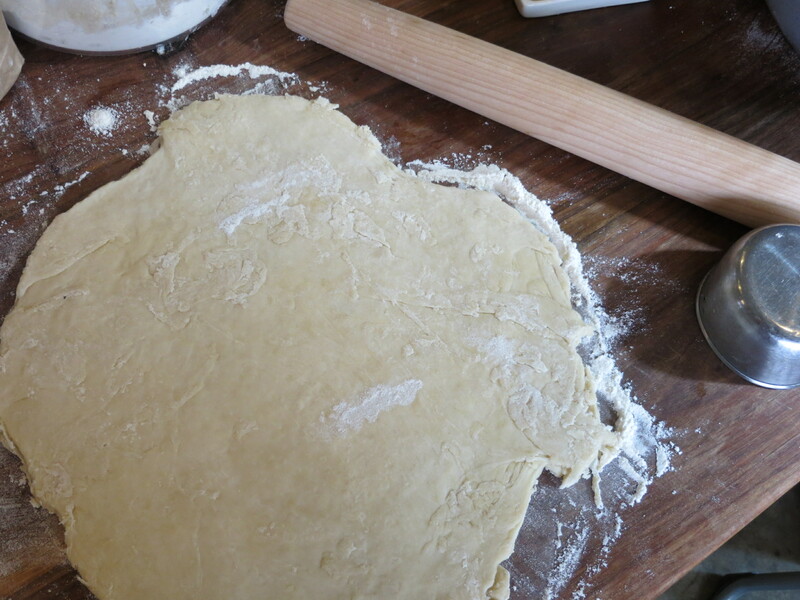 Add flour, gradually and mix until well blended. Cover and let stand 15 minutes. Roll out on floured board to ¼ in. in thickness. Cut into rounds with 3 ½ “ cutter. Place on baking sheet with has been sprinkled with 2 T. meal. Let rest 30 min. Sprinkle tops with additional meal. 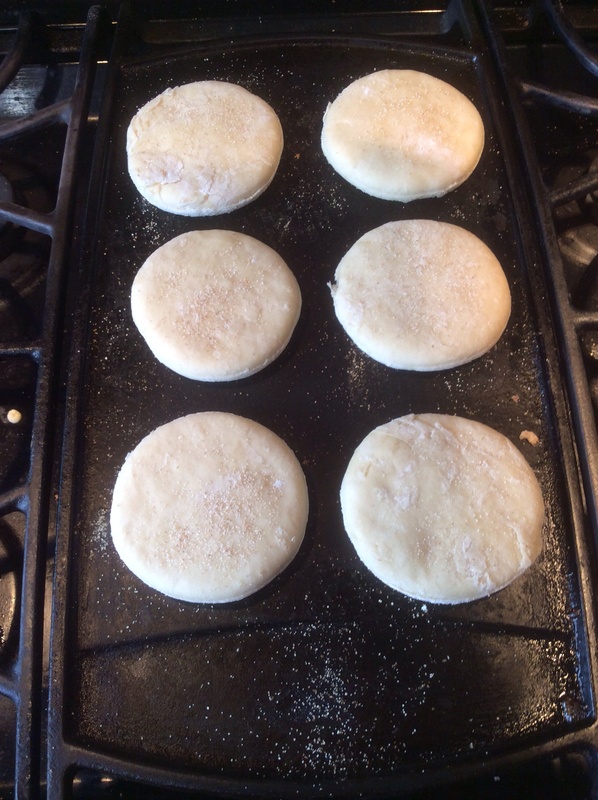 Bake slowly on hot ungreased griddle about 7 min. each side. I used dry active yeast dissolved in a 1/4 cup of water. But, I still used 1/2 cup scalded (very hot) milk and used 1/4 cup of cool water to cool the milk down. It worked fine. I also think that the sugar could be cut back just a little, and the rise time could be a little longer, 30 minutes, maybe more. 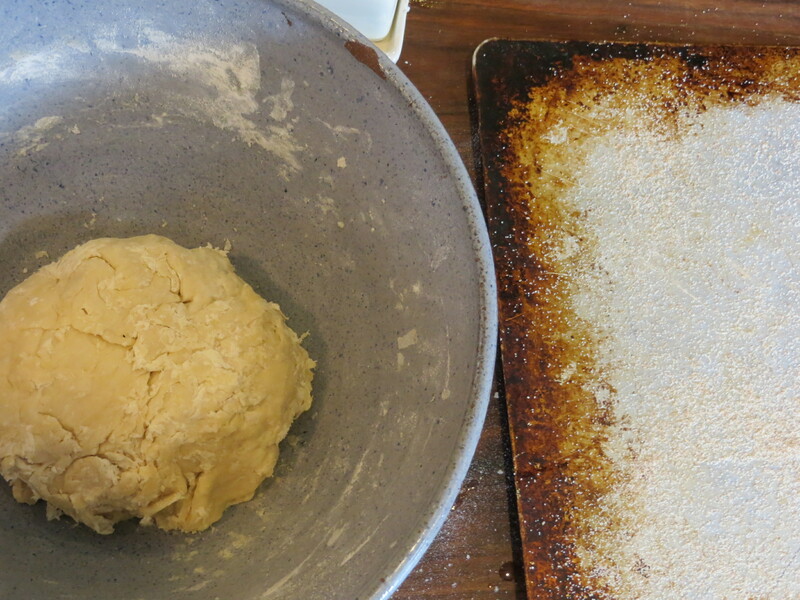 If you are like me and you get distracted by someone who needs you to help them with homework, fine art supplies, read them a book (or by running errands, playing outside, getting in the garden) — I think the dough will be fine. 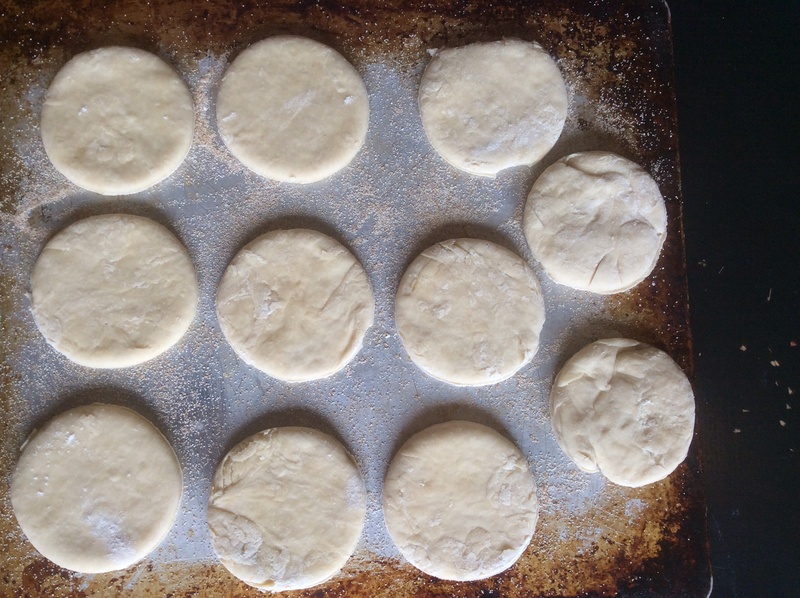 Also, I do not have a 3 1/2″ biscuit cutter, so I used a wide mouth jar lid (perfect size). I have a griddle to cook on, but a thick fry pan (cast iron) would work well, too. Also, don’t forget to open them with a fork (poke fork around the edge till it comes open). Good with breakfast, lunch or supper.